Guitar effects pedals can generally be divided into two categories – those that have an obvious impact on your tone, and those which take care of business behind the curtains. The former group is where you can find all of your distortions, overdrives, reverbs and similar. The later group is full of awesome effects which include EQs, compressors, noise gates and other. Both of these guitar effect types are essential for a refined and tuned up guitar tone, even though one of them is much more popular than the other. Boss CS-3 Compressor/Sustainer pedal belongs is among those pedals that you won’t notice if they are used correctly and do their job. It’s an awesome, inexpensive tool which is capable of seriously transforming your guitar’s tone. Today we are going to take a closer look at this stompbox and talk about what type of performance it is capable of bringing to your pedalboard. With that said, let’s begin. Compressors are an awesome tool to have at your disposal. While a lot of guitar players are on the fence when it comes to these pedals, the truth is that one 30 minute session with a compressor leaves you thinking how you ever managed without it. 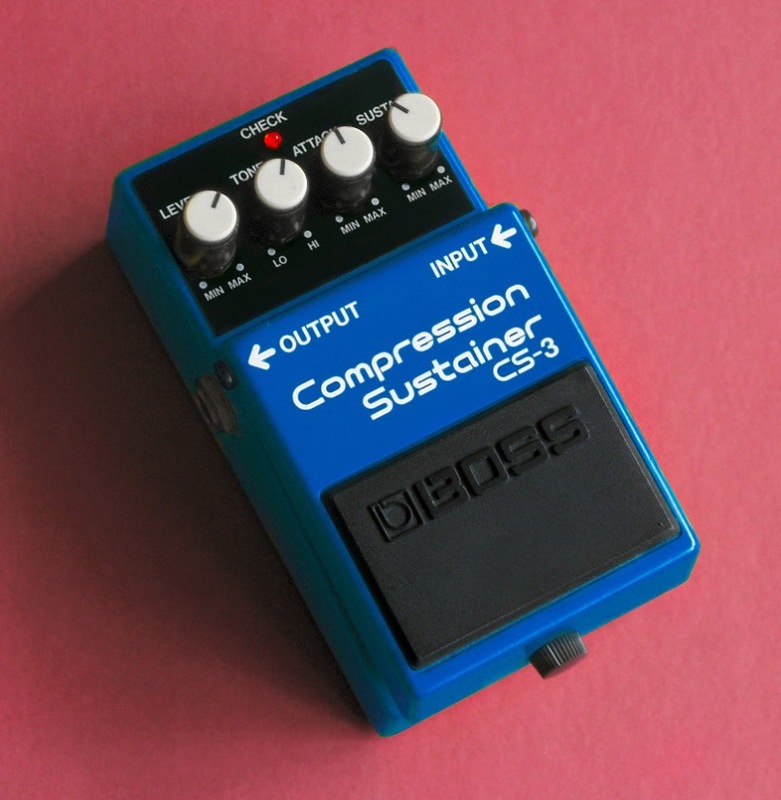 In simple terms, a compressor pedal is there to level out your volume when it reaches a certain value. At the same time, it boosts the volume when it is lacking. When used correctly, a compressor will a give you an even and unbiased volume as long as you play, and most people won’t even notice. You, however, will and your life as a guitar player will be that much easier because of it. Boss CS-3 is one of the simpler compressors you can get. It is actually a dual purpose pedal, considering it acts as a sustain pedal as well. This type of combo is awesome, especially when it works well. Here is a video review to introduce you to the Boss CS-3 pedal if you’ve never seen it in action. Boss is known for two things – quality effects pedals and the design of their pedal enclosure. Boss CS-3 comes in the very same body that all other Boss pedals share. The color for this model is bright blue, which is the only way you could discern what you’re looking at from a distance. Needless to say, CS-3 is one tough pedal that can take all of the abuse that is normal with consistent stage use. This pedal comes with four control knobs available. You have the Level knob which is used to adjust the volume of the pedal. Up next comes the Tone control. This is the knob you use to set the frequency at which the compression is going to kick in. Attack knob determines how fast the compression is going to kick in after you play a note, and finally, there is the Sustain knob. This control is used to determine how long the compression is going to last. For a compressor, these controls are pretty rudimentary. With that said, you can still hit a decent level of finesse with what is available on CS-3. This trait alone made it one of the favorite compressors on the market, with guitarists such as Jack White using these pedals as well. When it comes to powering this bad boy, it’s the usual story. You can either go with a 9V battery, a power adapter or a pedalboard power supply. In terms of performance, Boss CS-3 offers a great bang for the buck value. Compression works well and you can still dial it in pretty accurately. While it’s not going to be something a professional who needs absolute fidelity would use, it is definitely enough for the vast majority of guitar players out there. One of the main attributes of any good compressor is transparency. If a compressor changes the color of the tone, it does more damage than good. Boss CS-3 is not completely transparent but is much better than most of the pedals in this price range. Sustain is the other part of CS-3’s functionality, and it is quite awesome. When you work with sustain pedals, those of lower quality will add sustain but it just won’t sound right. In the case of Boss CS-3, the situation is completely different. You can push in a lot of sustain and it will sound natural. As a matter of fact, entire effect CS-3 has on your signal comes across as organic. What type of power source you are using is definitely going to have an effect on your tone as well. Just like it is the case with other effects pedals, a battery or a dedicated power supply is going to bring the best results. There’s nothing worse than having to deal with that annoying buzz, especially when you are working with a pedal such as a compressor. Here is one more short video review of the pedal, this time by the folks at Sweetwater Sound. Compressors, like many other low profile modulation pedals, are a tool that is used when you need to elevate your tone to the next level. One of the issues with these type of pedals is that you can sink in a lot of money into them, and it will be worth it. Budget solutions like Boss CS-3 are essential for working musicians who can’t afford to invest into a boutique model. In that capacity, CS-3 is the patron saint of guitarists all around the world. The pedal works, and it works well. Just the fact that it combines compression with sustain is amazing and makes it a package that you just can’t ignore. Is it the perfect solution? Probably not, but it was never meant to be the silver bullet. Boss has a way with designing effects pedals so that you get the most bang for your buck, which is exactly what Boss CS-3 offers. You can even look at it as a learning vessel of sorts that will help you figure out where you want to go in terms of perfecting your tone, and what your next pedal should bring to the table. On its own, this stompbox deserves all the praise it gets.